Teaching in favela Jardim Colombo, Sao PauloThe World Cup is almost over and once again England is home disappointedly early. But for me, the World Cup has been a huge success. I’ve just returned from running a three-week photography workshop in the favelas of Sao Paulo which I genuinely feel has made a difference to lives of eight young men and women. In 2010, actor/producer David Westhead and I created ‘Wembley to Soweto’ as a photography-based training course to be run during the South Africa World Cup. It was (and still is) aimed at providing professional photographic training and life-skills to historically disadvantaged young people, helping them to move their own lives forward by creating opportunities and ultimately, for them to make a positive contribution to their own society. The project has by all accounts been a huge success, with the backing of such luminaries as Dame Judi Dench and Alan Rickman, and has since run in Newcastle, Brighton, Cumbria and most recently during the London 2012 Olympics. In fact, the project does not stop when David and I leave – we continue to work online with our students in every project we’ve run, encouraging them to develop their careers by offering advice, support and feedback. Based on this success David and I, together with our brilliant PR Director Susan Morton, embarked on a marathon fund raising exercise to run the project in Sao Paulo during the 2014 Brazil World Cup. It was a hard slog, but we did it, thanks to so many people who were so generous, especially in the Hastings/Brighton area, donating money, cameras, equipment, expertise and time. In Sao Paulo, we ran the project out of the Uniao (Union) Community Centre in the heart of favela Jardim Colombo, in the southwest of the city. 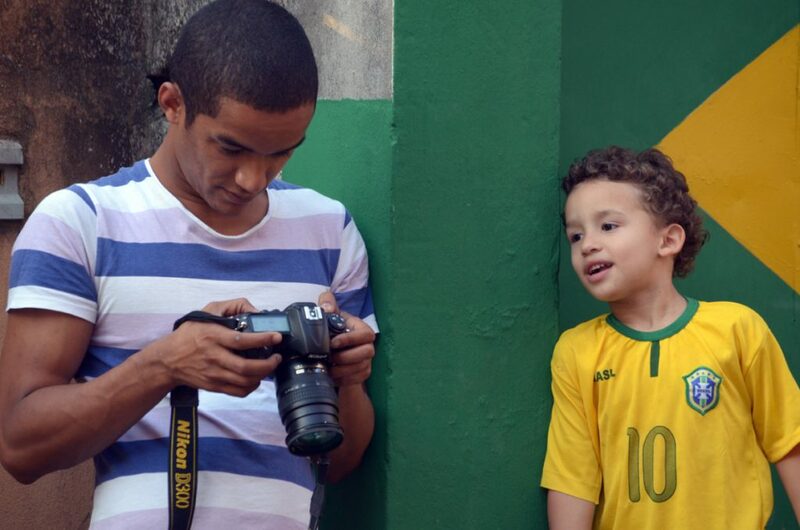 Our objective was to let the young people in the favelas tell the story of the World Cup from their point of view. I know that the favelas have a terrible reputation for violence, and some indeed may be violent, but the people of Colombo couldn’t have been more welcoming and supportive to our project. Joao Paulo Lima (nicknamed, Baqueta, in photo above), who we met during our April recce, managed through sheer determination and perseverance to find us seven more students for the course: Gustavo Rei Panda, Monique, Vinicius, Erika, Gleicimara, Mauricio and Gustavo Henrique. Tariana, a Brazilian student from our London Olympics course, joined us as student, translator and mentor to the younger students. Two of our previous students — Thapelo Motsumi from Soweto and Kasey Newton from London’s East End – joined us for a week to work with the students. With Thapelo, Kasey and Tariana as teachers in Sao Paulo, the project had come full circle, so that those who were taught were now teaching. 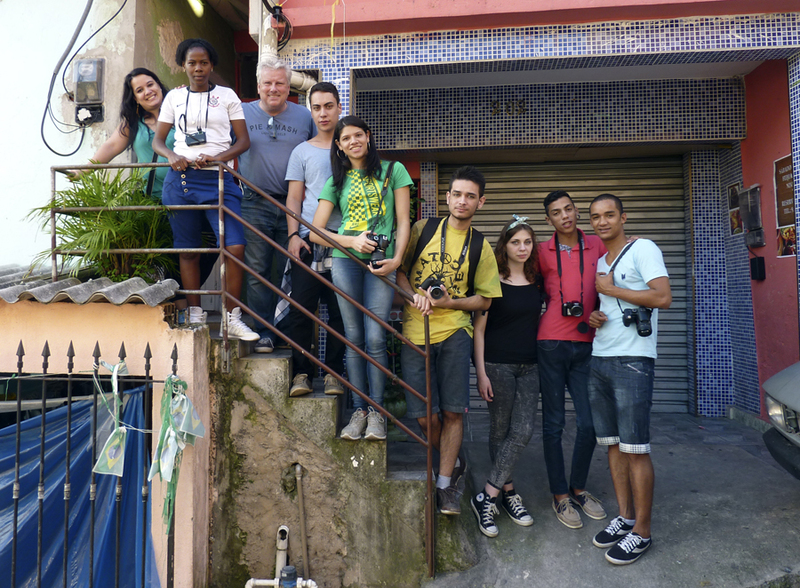 The students photographed all three of Brazil’s matches in the favela. Some people watched the matches in cafes, but most residents moved out onto the street for makeshift street parties, watching the matches on huge TV screens. 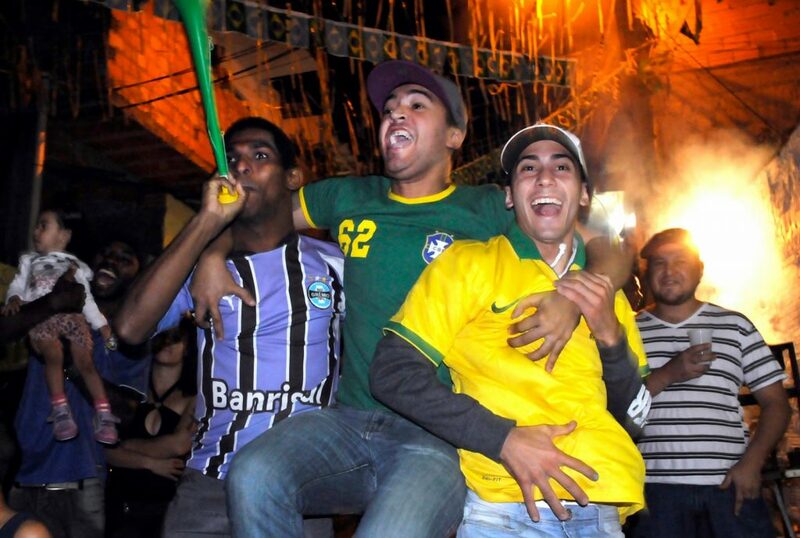 Though hesitant at first, our students soon became adept at capturing the joyously boisterous celebrations of Brazil’s march to the semi-finals of the World Cup. We also ventured into the centre of Sao Paulo to photograph the Praca da Se, the elegant Cathedral square filled tourists, beggars and homeless citizens; the Mercado Municipal, the huge central market filled with colourful produce and the rich fragrance of meat, fish and cheeses; the charming port town of Santos with it’s crumbling colonial elegance amidst gigantic lorries trundling along the seafront, as well as a visit to the hallowed shrine of Santos football stadium and museum; and an evening in the Sao Paulo Fan Park for the England v Uruguay match, documenting the strange tribal behaviour of English football fans. But most of all it was about witnessing eight young men and women from the favelas, some with no photography experience, grow in photographic ability, as well as in their own self-belief and confidence. From the very beginning in 2010, ‘Wembley to Soweto’ has been blessed with some sort of magic. Good people do good things when we least expect it. By sheer coincidence, my very last night in Sao Paulo was the night of the Queen’s Birthday, which the British Consulate kindly invited myself, Baqueta and Monique to attend. Prince Harry was to be the guest of honour. One day later and these young students would never have had the chance to attend such a prestigious and glitzy event. 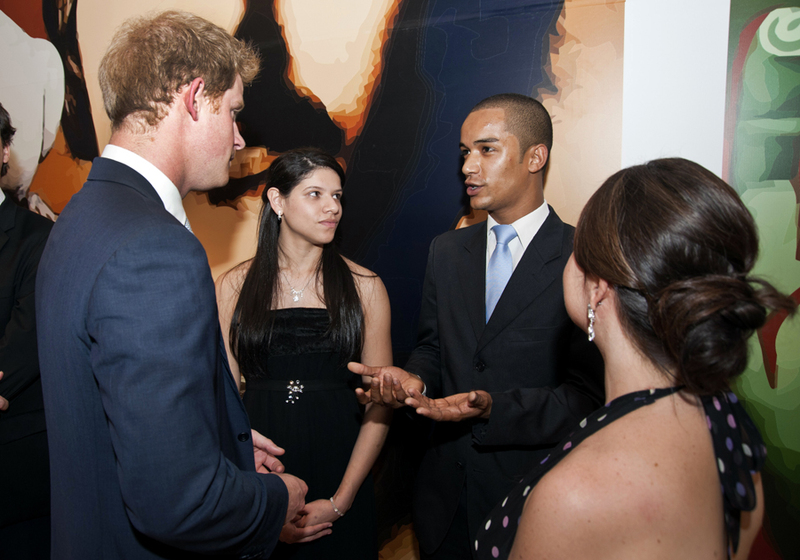 Baqueta told me that when me met Prince Harry, the Prince said, “I’m jealous – I wish I could be in your place and have a day doing what you do.” Maybe not the official royal seal of approval, but close to it! Prince Harry, eat your heart out. Rio Olympics 2016, here we come! Please have a look at the students’ photos published by the Guardian!